Been away - very busy - then I got 'flu. I've been laid up for 8 days! I'll be at my desk early next week. I'll post all the details then for you. I've also done some work on reproducing the old Toko S18 series of coils, using a 3D printer for the former. My home-made coils are better than the originals! I will put up the code for anyone else who wants to make them. The Toko S18 series of coils were the standard parts used by everyone, as they were stable, cheap and gave reproducible results. They had a plastic former and were wound with silvered copper wire. The colour of plastic denoted the number of turns! My old rigs in the 80s used a violet one for the VCO with an aluminium slug (it was very stable even without a PLL) at half frequency, then another violet one in the buffer stage, and yellow ones in the doubler and filter stages. All the subsequent coils (except chokes) were self-supporting air-cored, usually wound with enamelled copper wire. I used to use reverse-biased green LEDs for the VCO tuning, and reverse-biased 1N4001 for the modulation. These were much cheaper than proper "varicap" diodes and gave great results. The early stages used BF494 transistors to get to 100mW, all running at 15V, then a three-stage PA with a 2N3866 into a 2N3375, then a 587BLY for around 95 Watts, all running on about 30V. The only expensive parts were the output capacitors, the smoothing capacitor, the heatsink and the mains transformer. These rigs - which were used by loads of stations - were clean, stable and reasonably idiot-proof! They went on to three PCBs - exciter /PLL, PA and PSU. The boards were double-sided, and made as a single board, which was cut up. There were three versions, early - using 74LS logic and diode programming, middle - using a Plessey prescaler and CMOS logic, and the final version using a Philips all-in-one PLL chip and a PIC! The rig was meant to be as cheap as possible. Parts price was around £30 in 1982. Each had a concealed serial number and we made just over 1200 of them over the years. There were a couple of other variants - just higher or lower power - and we made about 500 of those. Other "builders" would often sell them on as their own work! I was pleased recently to discover a station in Italy still using two of them after nearly 40 years! Any pcb for this yet ? Otherwise I’m gonna have to sit there for hours and draw it all out lol. There's also the Bowman design kicking around the web and it had a PCB layout in the release notes but pretty sure it uses Toko cans so you'll have the same problem. Enigma still had some OEM S18 coils last I looked. Yes - long enough for you to have drawn up the layout yourself! It's not rocket science. I think I have uploaded this before? I still have an original bowman here! Often thought of reproducing it but couldn't identify the TOKOs the diagram does show the PCB connections and if I remember correct, the input coils are just standard trimmers with a couple of turns of copper wire wrapped around? Thank you MC Spanner for clarifying that to me ,i do not know what to do without you and without youre valuable answer if you do not saying that to me . A friend of mine has taken to hacking cheap transistor radio boards for Band I receivers. He buys a "Philips" brand radio, removes the PCB from the case, pads down the local oscillator to get it to around 70 MHz, replaces the input filter coils and capacitors, removes the telescopic rod aerial, and mounts the PCB into an aluminium box. The aerial input is through a BNC connector, and the audio / multiplex output is through a phono socket. There's also a "tuned" indicator LED, and he adds an LM311 comparator and a relay for carrier detection. There's also a muting transistor that shorts the audio output when no signal is received. These things are free-running oscillator jobs (no PLL) but have AFC (automatic frequency control) that locks the receiver to the incoming signal. 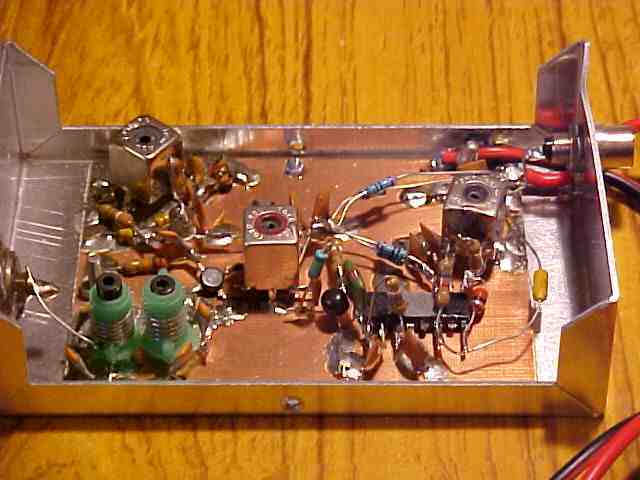 His link transmitter is very simple, with a 30MHz free-running Colpitts oscillator, doubler and two stages of amplification up to a couple of Watts. It doesn't matter if the link transmitter drifts a bit, because the receiver will follow it!